Today, our firm filed an amicus curiae brief in the U.S. Supreme Court in support of petitioner National Taxpayers Union. At issue in this case is the constitutionality of a statute — section 1140 of the Social Security Act — which was misused to uphold significant penalties against National Taxpayers Union for engaging in core political speech, entitled to the strongest First Amendment protection possible. The amicus brief submits that the court of appeals erred by failing to apply correctly certain precedents of the Supreme Court, and that the decision of the court of appeals, if allowed to stand, would impede the free exercise of core political speech by persons and organizations critical of government policies and programs. 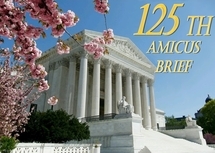 Our amicus brief was filed on behalf of Free Speech Defense and Education Fund, Inc., Free Speech Coalition, Inc., The Abraham Lincoln Foundation for Public Policy Research, Inc., American Civil Rights Union, American Conservative Union, Americans for the Preservation of Liberty, Concerned Women for America, Conservative Legal Defense and Education Fund, Downsize DC.org, Downsize DC Foundation, English First, English First Foundation, First Amendment Project, Fitzgerald Griffin Foundation, Freedom’s Call, Inc., Gun Owners of America, Inc., Gun Owners Foundation, Heritage Alliance, The Lincoln Institute for Research and Education, Media Research Center, The National Center for Public Policy Research, Public Advocate of the United States, The Senior Citizens League, Traditional Values Coalition, U.S. Border Control, U.S. Border Control Foundation, U.S. Constitutional Rights Legal Defense Foundation, Young America’s Foundation, American Target Advertising, Inc., ClearWord Communications, Inc., and Eberle & Associates, Inc.